LaGrange 1918 Windmill was in middle of today's main street about 300 feet north of highway. An 1837 decree allowed the town of LaGrange to be platted, and land claimed all around it by the LaGrange brothers. Not much is known about this decree except that it allowed land to be claimed just by platting a town. The trail herds passing through LaGrange were a source of cattle for people who legally or illegally acquired land to graze them on. Stories abound of these early day residents but few can be documented. Most permanent type residents did not arrive as early as 1837, but after about 1860 a number of people came to Wyoming for various reasons. Quite a few took out homesteads at this time. In the early spring of 1889, S. J. Robb, a Wyoming cowboy, and Nels Robertson who owned a store in neighboring Banner County, formed a company to start a merchandising business. Kale LaGrange, owner and founder of the Miskimins' ranch gave them inducements to locate on the present site of LaGrange, it being a part of the ranch. The town was named for him. A store building was built as was a home for the manager, S. J. Robb. Far-sighted Easterners began to move into the area, secured a mail route from Pine Bluffs and got set to make it a magic city of the plains. Besides a grocery store being established by Mr. Robb, a large lumber yard and hardware store was located by Brown and Biggs, an ice house with a dance hall above it, a frontier saloon, a newspaper, "The LaGrange Index," said to be set up by a man named John R. Smith, a cheese factory was located by a Mr. Hendrickson, the milk being supplied by Wyoming and Nebraska settlers; a large grist mill was built on the banks of Horse Creek on the present Ed Johnson place, where homesteaders brought wheat and corn to be made into flour and meal. This mill was operated by steam, the fuel being sometimes coal and sometimes pitch pine wood. It did a large business for several years. A livery stable, where horses were fed and men drank and fought, was a part of the early business equipment. 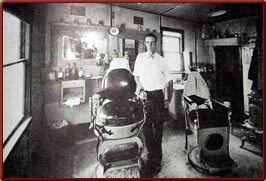 A Mr. Campbell was the first blacksmith to locate in LaGrange. The cheese factory went out of business after two years because it was not profitable. The Biggs and Brown store then burned to the ground mysteriously. They sold their interests to Mr. Robb, who being a cowboy became restless and sold to Charles Badgett of Cheyenne. It soon burned to the ground, and a smaller store was built. The Yoder brothers then took over, then followed in succession, Rice, Tom Gartner, Beck, Tom McComsey and E. L. Chamberlain. Again the store burned down. The town was without a store for several years. The LaGrange Mercantile Company was formed, bought a large hall that had been built and put in a large store—groceries, hardware, drugs, machinery. This was also destroyed by fire in time. The company bought an old school and carried on a few months, then sold to the Mercer Mercantile Company, with L. M. Mercer as head of it. 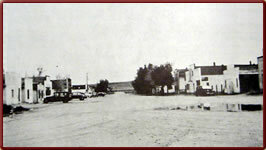 The Stockgrowers Bank of Cheyenne had a bank here from 1917 until 1923. Numerous other businesses flourished and waned in those years— a flour mill run by water power, dance halls, and saloons have not been mentioned. The first telephone line was extended into LaGrange in 1904. Later, LaGrange had for years the only dial system central in Goshen County. 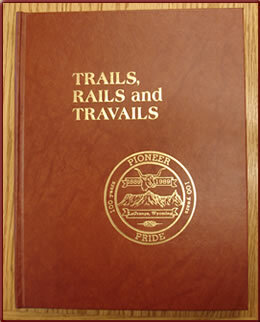 The coming of the Union Pacific brought a new era. They began building in 1927 and by Labor Day, September, 1928—when the town celebrated the completion of this great road—it was completed. Five thousand people attended the completion of the railroad. When a welcome train came through on Oct. 9, 1928, 200 people were on hand to greet it. During the erection of the railroad the town experienced a boom. 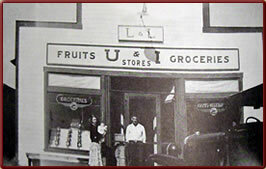 Several grocery stores, hardware stores, a clothing store, bakery, drug store, barber shops, and hotels sprung up. 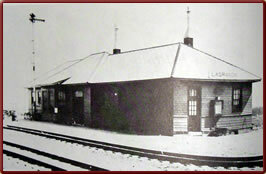 The depot, stockyards, light plant, and schoolhouse were also built in 1928. Ironically, the depot, which at one time did a lot of business is being torn down and the lumber carefully sorted and hauled to Torrington to be used in construction of another building by the man who purchased it. 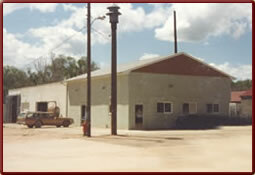 The depot was closed a few years ago and railroad business is conducted by a mobile unit. 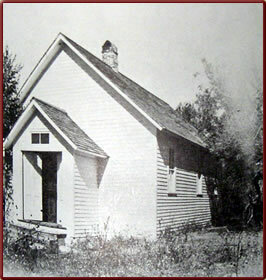 The first school house built on the townsite was long, one room with four windows, many names of teachers being forgotten. Among those remembered are Martha Thomas, later known as Mrs. LaGrange, and still later as Mrs. Winnie Miskimins, Florence LaGrange, a Miss Richards, a Miss Gapes and Bessie Burke. Here were taught the three "R's," the average term being six months per year and the salary $40 to $45 per month. LaGrange had the first consolidated school in the county, as well as the best of its kind. A new gym was built and dedicated in 1951. In later years improvements have been made, the main one being a new elementary addition built which has one large room for kindergarten through sixth grade and is worth visiting to see how school can be efficiently conducted in these modern times. In the spring of 1890 a Union Sunday School was organized, people came from miles around. It was the first Sunday School in LaGrange or anywhere near. Ministers came during the summer months, Baptists and Presbyterians. The first regular minister was Rev. Day, a Methodist. 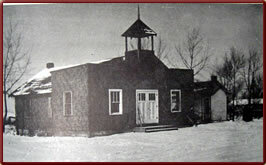 Services were held in the school house. Preachers were mainly homesteaders and some names still remembered are Rev. Puckett and Rev. Hughes. The first church was built in 1918. When the need was realized, the late Frank Jones, Otis Lovercheck, John Bunn, Harve Babbitt and Nels Sherard started a fund raising project. The church was located on the south part of the townsite on which it now stands. The basement of the building was used for a school house for a time. The church was under Presbyterian mission for some years and pastors were supplied in this way. In 1947 it was organized as the LaGrange Community Church. It is now the LaGrange Bible Church and the resident pastor is Pastor Don Mathis. There is also a Pilgrim Holiness Church which was established in 1930, and present pastor is Rev. Phillip Kline. 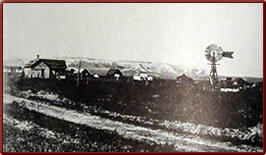 The first cemetery was started on three acres joining the church on the west, May 3, 1920. Mrs. Christine Roseberg, grandmother of Mrs. Bill Kirlin and Bert Cooper was the first one buried there. In April of 1928 the site was moved to the hill east of town and now stands out as a thing of beauty for being in the country. The late Otis Lovercheck was responsible for having many evergreen trees planted which can be seen for miles. He hauled water every day for long periods of time to get them started. Nels Sherard, E. L. Chamberlain, and Frank Wiand, all now deceased, followed in succession as caretakers. Clifford Gregory worked for several years, and Arthur McGill is presently in charge. Incidentally, in 1934 an airport was built east of LaGrange, and was in use for several years. 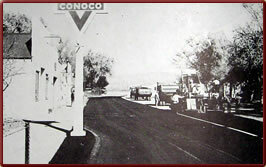 The same year an oiled road was built through town, linking the state line six miles east to Highway 85 west of town. In 89 an official post office was established in LaGrange, Laramie County Territory, by S. J. Robb. This P.O. was supplied from Salem, eighteen miles south of LaGrange. 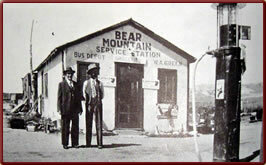 The nearest Post Office was not on the same route, and was "Goshen" located NW on Bear Creek. The town population at the time numbered between 250 and 300 according to the postal application Other population to be supplied by the Post Office numbered about 500. This post office application was signed by Gust F. Blixt, ''Post Master at Pine Bluffs, Laramie County, Wyo., July 24, 1889. Theda Arnold, present Post Master has copies of the National Archives Records showing later post masters to include, S. J. Robb, 1889; Dement Brown, 1891; Martha A. LaGrange, 1892; Benjamin F. Yoder, 1893; Jerome S. Rice, 1895; Wiliam H. Beck, 1899; Oscar Yoder, 1901; Martha A. LaGrange, 1903; Martha A. Miskimins, 1904; William R. Kirlin, 1928; Verna Bess Coen, 1954 (acting); Dale E. Howery, 1956; Theda Arnold, 1972, up to present day. On May 20, 1938, an election was held which was the climax to incorporating the town. Cliff Noyes was elected mayor and the councilmen were Percy Fisher, Clyde Warner, Hugh Brady, and Oris Chamberlain. Mayors through the years have included Lester Mercer, W. E. Chamberlain, Jack Robertson, Arthur McGill and Curtis Grandstaff. In 1967 the Frontier School of the Bible started with twelve students enrolled, with enrollment and substantial growth realized since. The former drug store, old telephone office, barber shop, and cafe building, Talbert's Garage and home, and several other homes have been purchased by the school and remodeled, or added to, to provide classrooms, dining hall, dormitories and homes for students and faculty. This has added much to the appearance of the town as everything is so well kept. Classes are in session from mid August until mid May, when many return to their homes for the summer, many of which are in Michigan, Nebraska, Iowa, South Dakota, and Colorado, to name some. The school offers a three-year course in general prep arations for the ministry, mission field, and Christian education, and is nondenominational. The town has a volunteer fire department, rescue unit with trained personnel, the latter being kept busy answering calls for accidents and taking the sick to the hospitals. There are also American Legion and American Legion Auxiliary Units that are very active in civic duties, also a Home-makers Extension Club, as well as 4H clubs.